First, there was Apple TV. Then came the Roku. Now, it's Amazon's turn: Meet the $99 Amazon Fire TV, an impressive all-in-one streaming video, music and gaming device for your living room TV. Like the competition, the 0.7” thin Amazon Fire TV offers access to Hulu, Netflix, Amazon Instant Video, Pandora, iHeartRadio, YouTube and a handful of other popular streaming media services. A voice search feature that holds promise for quickly find individual shows, and a cool new predictive feature called ASAP pre-buffers episodes it predicts you might be watching next. You'll also find a suite of parental controls to limit kids' screen time. 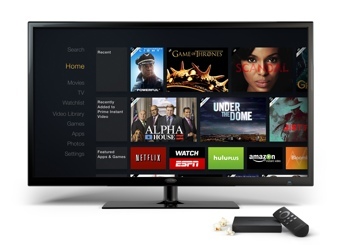 But Amazon Fire TV isn’t just about watching the action – it’s also about participating in it. The tiny box doubles as a low-cost microconsole gaming system, bringing mobile-style favorites like Monster University and Despicable Me: Minion Rush to your TV. Games have an average price of $1.85 each, and tend to be more kid-friendly than on larger game consoles. Downloaded games can be played using the included remote or an optional game controller, sold separately for $39.99. and USB connections. The device is also WiFi ready. The only real downside to Amazon Fire TV is that it’s a new offering, and not all your favorite streaming video and music services will be available at launch. HBO Go is missing, for example, as is music-streaming service Spotify. Hopefully, this should change with time. You also won't be able to access content you purchased through iTunes as you can on an Apple TV, but that's true for all non-Apple TV boxes. Amazon Fire TV is currently available for purchase at Amazon.com for $99.00 and ships immediately. 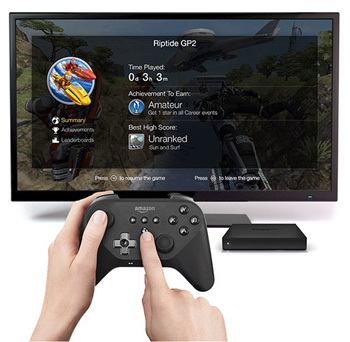 The optional $39.99 game controller is available, bundled with the game Sev Zero and $10 worth of Amazon coins for in-app purchases.